Do you have heat damage? And do you need a heat protectant for your hair? You have probably heard that using a heat or thermal protectant on your hair is important for guarding against heat damage, but is it something you really need? Working around the world, our friend celebrity stylist Cash Lawless keeps beauties like Jenna Dewan and Bella Hadid looking amazing by focusing on the health of their hair as well as proper styling techniques. Read below for tips Cash shared on diagnosing damage, getting your hair healthy, and keeping it that way. SEVEN: What are the signs that your hair needs a heat protectant? Cash: First, look at the ends. This is the oldest hair and has seen the most abuse so signs of damage will show up here first. SEVEN: How to can you detect possible heat damage? Cash: For hair that may not be severely damaged but you’ve got a hunch, I use a “grab test” that almost anyone can do. For longer lengths of straight, wavy, and soft curly textures, grab a small piece of hair about 3-4 inches from the ends. Now shake the hair gently up and down. If the hair bounces and moves you are in great shape. If the hair is dead straight and stiff, you’ve got serious damage. SEVEN: How can you detect heat damage on shorter or textured hair? Cash: Feel the texture of your hair at the root in its least exposed and hypothetically healthiest area, then feel the hair at the ends. How do they compare? If the hair at the ends feels crunchy, dry, and stiff compared to the roots, you’ve got damage. SEVEN: What about severe heat damage? What are the signs? Cash: If your hair is severely damaged, no grab, weight or bounce test is necessary. You will see white nodules at the ends of your hair. A quick friction test will tell you a lot. Slide one hair strand that has a white nodule at the end between two fingernails. If heat damage is present, the white tip will break off easily. Curing heat damage – what is the solution for damaged hair? Cash: Prevention is the only way to avoid heat damage as there is no product in the world that can give you back the hair that has broken off. Only time and good choices can help you grow back healthy strong hair. Treating damaged hair from the start – Cash’s tips to prevent damage and keep hair healthy. Tip one. Diet and your hair. Cash: Good hair starts with good health, so you want to start from the inside. Ensure that your body is getting its minimum necessary protein. Hair is made of protein, and if you have a low protein diet you may suffer from weaker hair strands. Cash: Get on a supplement that supports the growth of strong hair to make up for where your diet may be failing. SEVEN’s OPTI supplement is a great place to start. These supplements work, but remember you must commit to them for 6 months or longer in order to see their true difference because the vitamins do not help the hair that is already on your head. It makes new growth healthier. 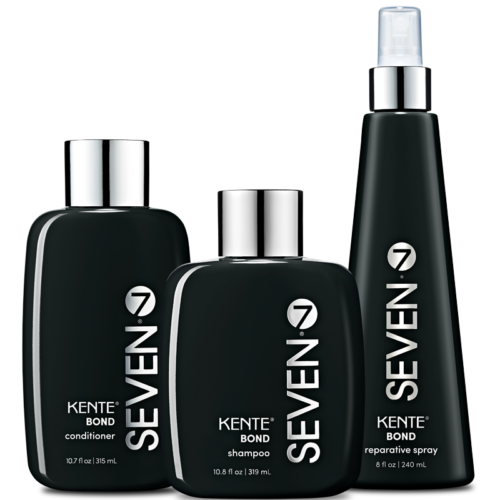 SEVEN: Read more about supporting healthy hair with supplements here. Discover OPTI biotin supplement here. Cash: If your hair is already damaged there are band-aids––products that help heal, prolong the life of your damaged hair, improve the appearance, and prevent further breakage. There have been some strong recent developments with this recently, and companies like SEVEN have been pioneering in this space. The BOND system uses a proprietary formula that mends the hair using positively charged ingredients. 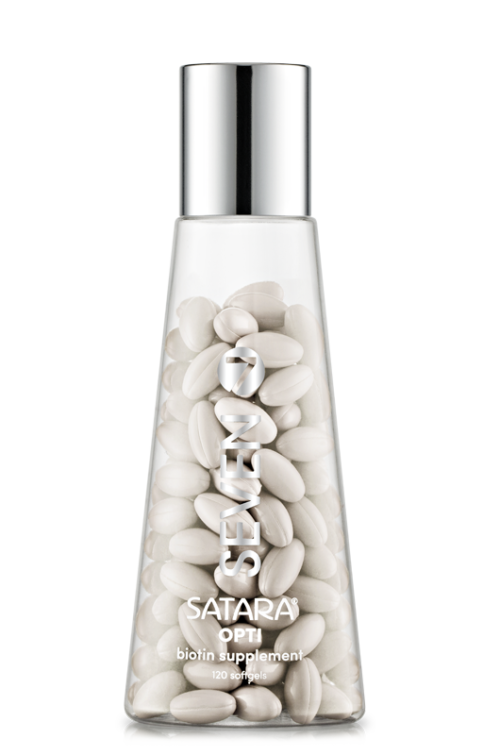 Damaged hair is negatively charged, and positively charged ingredients cling to the hair shaft, sealing the holes and damage to the cuticle extending the life of the hair and improving shine and strength. This drastically improves the appearance of damaged hair. Cash: Heat damaged hair is a torn piece of paper. No matter what you do, it will not be the same again. SEVEN: Well, that’s motivating…or depressing. But mostly motivating! The lesson here is that it is important to treat damaged hair differently. Damaged hair needs help staving off future damage and sealing the cuticle to protect the delicate inner cortex. 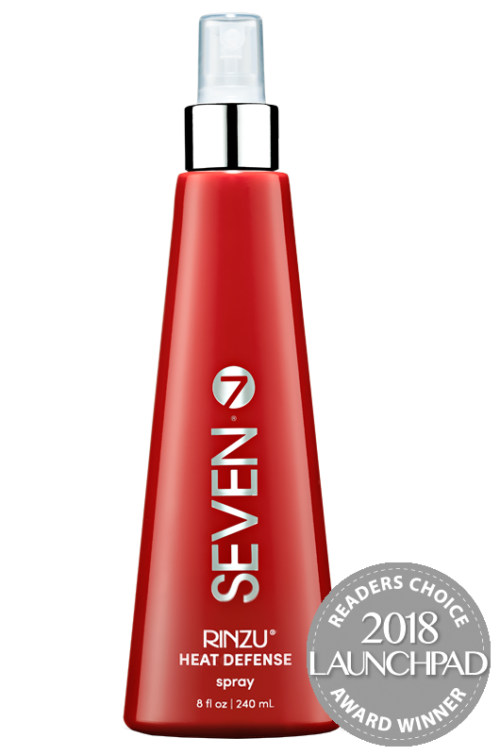 The Beauty Launchpad 2018 Readers Choice winner for thermal protection, our HEAT DEFENSE spray locks in luster, preserves the health of your hair, and guards against heat damage. Whether you already have heat damage or are trying to prevent it, it should be your first choice when using hot tools––including a blow dryer! Looking for more from Cash? Get his curling technique tips and more on getting the most out of your hot tools here.